Who Won the Digital Marketing Race of Election 2012? It’s amazing how the power of digital marketing was used during the 2012 presidential race between Barack Obama and Mitt Romney. Most voters had no idea about the underlying contest that was going on to affect the election of 2012. While Romney was no stranger to social media and digital marketing, Obama appears to have had the upper hand in just about everything digital. Obama demonstrated an incredible command of the data through the use of voter email addresses he has collected since 2008. Over 13.5 million email addresses were collected for the 2008 election, and certainly many more were collected in the 2012 round. Using this direct relationship with the voting public, Obama’s campaign team was able run numerous surveys to test public sentiment at any point during the race. This gave them the power to run a multitude of simulations and the ability to allocate resources where they were most needed. Obama used email extensively and employed a particularly sophisticated set of email testing — the kind we use when selling products and services online. Subject lines, from names (e.g. Michelle Obama, Jim Messina), and messaging were frequently tested to determine which worked best. Literally dozens of fundraising appeals went out each day. Interestingly, the campaigners themselves frequently guessed wrong when asked which test they thought would win. It just goes to show the importance of testing to make the big decisions. To note, a whopping 56% of Obama’s campaign money came in donations of less than $200 compared to 23% of Romney’s. Email most certainly played a big role in reaching those smaller donors. In the swing state of Ohio, Obama had over 29,000 email addresses that the campaign used frequently to poll and determine next steps. Email and social media were used heavily to send registration information, Obama’s views, relevant articles, Tweets, and more. In one case, there was an app used to send messages with pictures of friends in swing states. Appeals were sent to encourage friends to register and vote. According to one article, one in five recipients acted on the request because it came from someone they knew. We’ve likely all heard of the town-hall meetings that featured Romney and Obama. Obama himself led an “Ask Me Anything” Q&A session on Reddit, and over 200,000 viewers showed up. The event was yet another win by the Obama campaign to connect directly with American voters. Both camps leaned on these tools because they determined voters were not watching as much television, or not watching television in the same way, as they have in years past. Candidates were forced to connect in these new ways at levels even beyond the 2008 election. According to a Pew Research Center survey, close to one-third of voters were encouraged to vote for Obama or Romney through social media posts, while one-fifth of voters tried to convince others in social media to vote for their favorite presidential candidate. 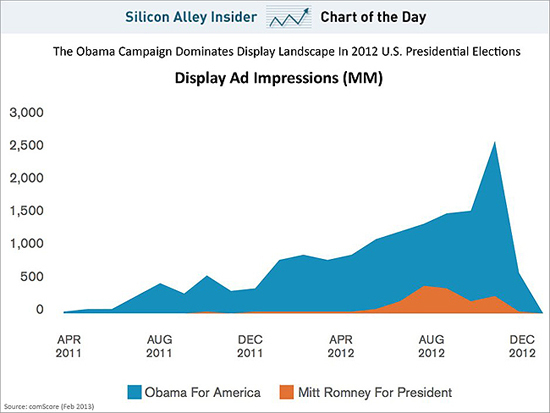 Business Insider shared further evidence of the overwhelming success of Obama’s online campaign. In a study released by comScore, there was a huge gap in online display ad impressions between the two candidates. Using the incredible stores of data they had collected, both camps were able to make more informed decisions compared to past presidential campaigns. Obama’s campaign, in particular, used data collected to drive nontraditional advertising buys in unconventional programs, such as “Sons of Anarchy,” “The Walking Dead,” and others. Overall, Obama’s campaign claimed that they had become 14% more efficient in television ad buys over the previous campaign in 2008. It will be interesting to watch how both Democrats and Republicans continue to leverage digital media for data collection, communications, voter engagement, and more. With the amount of data collected, appended, and modeled, I’d expect significant growth in the efficiency of campaign expenditures and messaging. It will also be interesting to see which parties and politicians do it best in 2016 and beyond. Please share any stories that impressed or surprised you about the use of social media, email marketing, or other digital marketing tactics during the 2012 presidential election. Who’s Winning the 2012 Social Media Election?